Feature the wine! Not the rack. Southern Homewares proudly brings you our simple steel 9 bottle wine rack. This easy to hang, low-key design easily mounts on any wall and makes the bottles look their best. No frills. 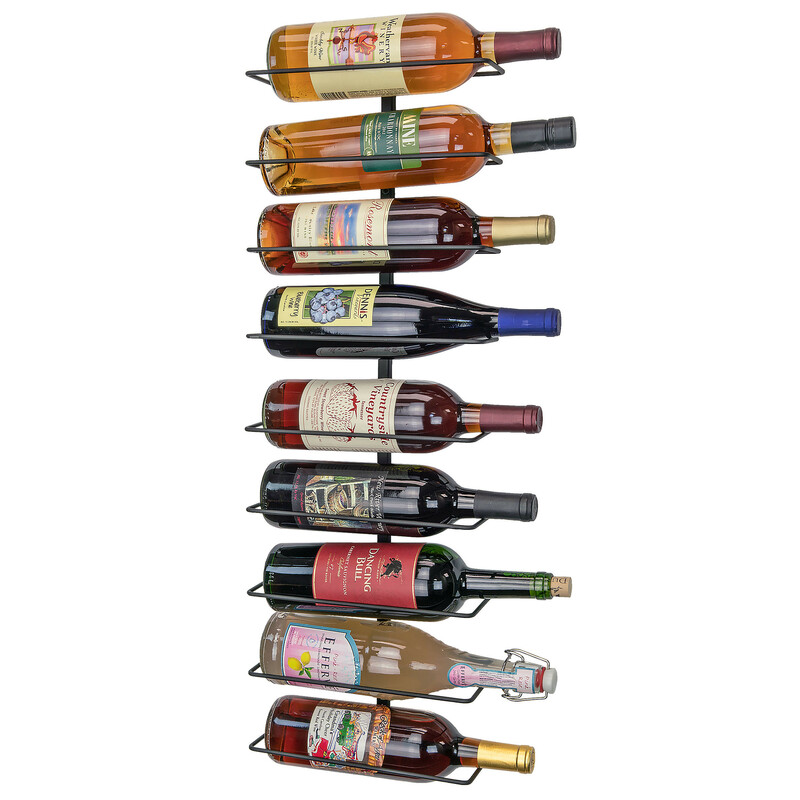 Use these racks individually as a nice accent piece, or hang several in a row to create a wall of wine! All while enjoying a simple solution that looks great with any decor. Enjoy! Feature the wine! Not the rack. Southern Homewares proudly brings a simple solution to make your home shine, and an easy-going way for you to invest in beautiful wine decor. This powder-coated steel design simply mounts with the included hardware, solidly holds nine bottles horizontally, and gives you the wall mounted wine rack you’ve been hoping to find, with a minimum of fussing around. Easily mount one rack to get a nice accent piece that showcases the beauty of the labels. Or… hang several in row to a create a wall of wine that decorates your space with a striking, unique, and colorful statement. Unlike many other racks on the market, this low-key design doesn’t feature the rack, it features the bottles. And that’s an important reason we’re so proud to bring you our simple solution. Decades-long, rust-free construction... and easy and quick installation with everyday tools complete the picture. Great for wine-lovers who want an accent piece for their kitchen or dining room, and just as great for restaurant owners who’d like a to make a visual impact. Order yours today, and enjoy the simple no-fuss rack that lets the WINE turn the heads. Enjoy! Color is black. Rack comes in two pieces, simply slide them together and attach to the wall with the provided hardware. Overall assembled dimensions are 10.06" x 3.88" x 28.75".